Updated July 7th: to include information on easy embedding in WordPress. 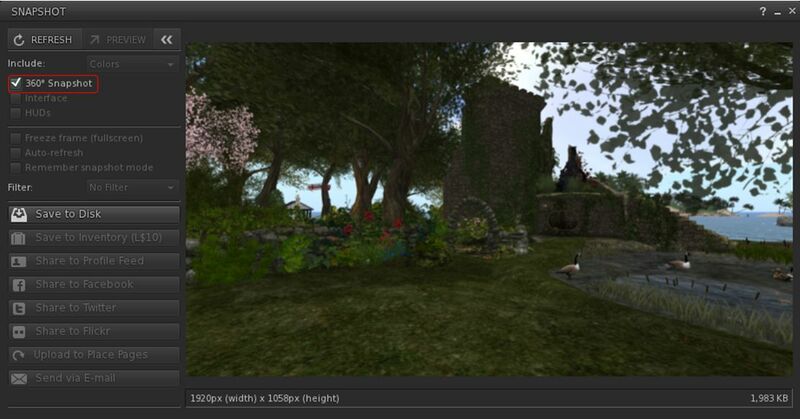 Linden Lab has recently made two updates to the 360-degree snapshot project viewer, which I’ve been meaning to review for the last couple of weeks. On June 19th, version 5.1.0.506488 of the viewer was issued, which included image processing updates, and which included offering the viewer in both 32-bit and 64-bit Windows flavours. Then, on June 29th, the viewer was further updated to version 5.1.0.506743 (at the time of writing the current version), which largely saw the viewer brought up to parity with the current release viewer. The core functional changes to the viewer in both of these updates is the removal of the need for manual post-processing via zip file download and a web back-end provided by the Lab (see my original hands-on of the initial release of the viewer for more). Instead, the viewer is intended to process the image and provide the necessary meta-date to allow automatic playback on most 360-degree image sharing sites. I’ve so far tested the viewer on Flickr and a number of 360-degree photo sharing sites such as VRchive. The latter appear to work as expected, Flickr requires 360-images uploaded from the viewer to be manually tagged from within Flickr in order to work. This is a minor inconvenience – but would be smarter if the metadata allowed for auto-tagging of the images as equirectangular, as can be done with other 360-imaging tools. A JIRA has been raised on this. In the meantime, here’s a look at taking photos with the viewer, and getting them working on Flickr. The 360-degree photo option is fully integrated into the snapshot floater, and when selected will disable all other options and will only allow you to save images to your local hard drive. Note that if you set any other options (e.g. check the Interface option or setting a filter) prior to checking the 360-degree snapshot option, this will result either in the viewer reverting to taking a “normal” snapshot, or ignoring the filter when processing as a 360-degree image. Position your avatar / camera at the centre point of the image you wish to capture (you can “hide” your avatar using a full body alpha or something like a “vanish” animation if you don’t want it appearing in the shot). Use ALT-cam or flycamming to position the camera if you want your avatar to appear in the image, but not at its centre. Use Menu > World > Environment Editor >Sky Presets > Edit Presets to set your desired Windlight and use the Clouds tab to freeze the clouds. Avoid the use of Depth of Field. Turn your camera / avatar slowly around in a circle to see everything in the snapshot field of view, allowing everything to render as you do so. Save your snapshot to the location of your choice on your hard drive. You can now upload it to your preferred 360-degree image sharing website. 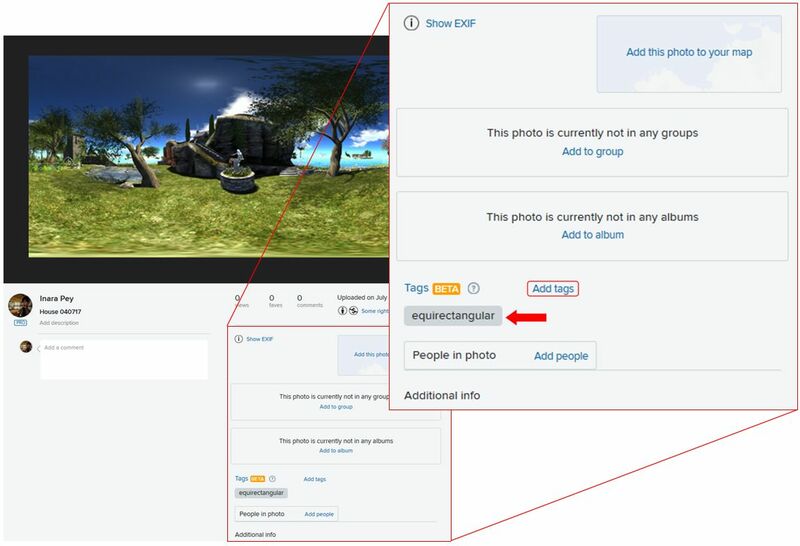 If you are uploading to Flickr, remember to manually set the equirectangular tag in the image page, and then refresh the page. The image should reload and display in 360-degree format. WordPress has a beta 360 photo and video processor allowing users to embed 360-degree images into their posts. However, in the case of images, this requires the .JPG file extension to be used. Currently the snapshot viewer uses .JPEG. However, once the extension has been changed, images should work fine. As noted, 360-degree snapshots should auto-play on any photo sharing sites such as VRchive which parse uploads to ensure they are in the required equirectangular ratio (information on using VRchive can be found in this blog here). Whether or not the viewer can be set so that the metadata allows Flickr to auto-recognise the 360-degree images as such, and simply play them without manual tagging remains to be seen. But as noted, it’s not a major inconvenience of not (after all, who of us here doesn’t fiddle with images post upload to Flickr?). As it is, this is a definite step up for the viewer in managing 360-degree images, and I’d certainly be interested in hearing from anyone as to how it works with Facebook. One other point to note as well is that at the moment, the 360-degree snapshot project viewer is not compatible with format used for 360-degree images on SL Places Pages. However, the latter will be revised to support displaying images captured by the viewer at some point in the future. To use the images produced with the Oculus 360 Photos app you just change the image file suffix from the (current defaukt) .jpeg to .jpg and that allows it to display okay. I’m curious, the LL viewer generated shot here looks much lower resolution (look at the roof lines or statue in the fountain/bird bath(?) than your previous 1024×2048 shots in the test album. It looks almost like AA was disabled. Actually, my bad. The image was a quick and dirty test image taken at the lowest ratio / resolution setting (1024×512) using the current viewer & I should have specified that when writing. The caption has been revised to reflect this. Viewer setting was High-Ultra, so AA, etc., all active.